Matt Ryan, who starred on the short-lived NBC drama, will voice the character. The DC Comics drama, which was most recently adapted for TV by NBC, will return as an animated series on CW Seed, it was announced Sunday at the Television Critics Association's winter press tour. Matt Ryan, who starred on the short-lived NBC drama, will voice the lead character. The animated series will consist of five or six 10-minute episodes that will premiere during the 2017-18 TV season. On CW Seed, Constantine joins fellow animated DC Comics series Vixen, which launched its second season in October. Additionally, the 13 episodes of the live-action Constantine drama are available for streaming on CW Seed. Like Vixen, which is set in the Arrow universe that consists of The CW's live-action dramas Arrow, The Flash, Supergirl and DC's Legends of Tomorrow, Constantine has crossed over with Arrow in the past. Ryan reprised the role in a 2015 episode of Arrow shortly after the series was canceled by NBC. Both Constantine and Arrow, like all of DC Comics-inspired TV series, are produced by Warner Bros. Television. When asked on Sunday about another possible crossover, The CW president Mark Pedowitz said "there are no plans to," but added that he'd love to have Ryan back. Based on the DC character created in 1985, Constantine centers on John Constantine, a man who struggles with his faith as he is haunted by the sins of his past and suddenly is thrust into the role of defending humanity from the gathering forces of darkness. In the NBC series, he was a British exorcist and occult detective who spends his days hunting supernatural entities. Daniel Cerone and David S. Goyer (Batman Begins) adapted Constantine for NBC in 2014 from the DC series Hellblazer. The series drew poor viewership and was canceled in May 2015. Despite efforts by Warner Bros. TV to find a new home for the drama, reportedly at NBC cable network Syfy, among other outlets, the cast was released from their contracts the following month. Goyer also will be an executive producer on the animated series, along with Greg Berlanti and Sarah Schechter, who also are exec producers on The CW's superhero slate. 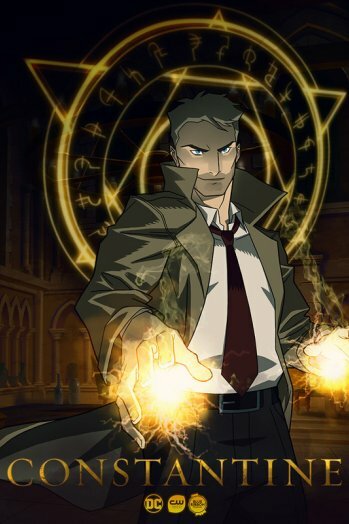 Constantine joins a crowded lineup of DC properties on the small screen. In addition to The CW's slate of superhero series, all of which were renewed Sunday for the 2017-18 season, the network also has iZombie; Fox is home to Gotham and Lucifer; and AMC boasts Preacher. NBC also is getting ready to launch the first DC Comics comedy, Powerless, this spring.